Submit inquiry and I will apply discount! Great 2 Bedroom + Loft, 2 Bath Unit. 4 star rating. Sleeps 8-10 comfortably. Main floor remodeled with vinyl floors, granite countertops, refinished cabinets, baseboards and paint. Bedrooms and bathrooms updated with new paint, baseboards and casings!! Brand new sleep sofa with memory foam mattress! Enjoy beautiful views of the mountains and trees from the oversized deck. The condo has a full kitchen with new range, dishwasher, microwave & coffee maker. There is a BBQ on the deck, 4 TVs throughout the house and lots of games. Relax and keep warm by the fire without stoking the wood all night with a thermostat controlled pellet stove! The complex has an outdoor spa, sauna and ping pong table. Mammoth View Villas is located off of Lakeview Blvd and once you arrive there is no reason to get back in your car until you leave. It is only a 5 minute walk to the Village where you can access the gondola to Canyon Lodge and take advantage of all of the shops, restaurants and Village activities. If you don't feel like walking the shuttle stops right outside the complex. The condos at Mammoth View Villas are not the typical 'hotel' style condos like a lot of the complexes. There are about 10 steps to get into the unit and it is tri-level inside. There is no one above or below you and only one neighbor to the side. The condo is very private and quiet and it has an over sized deck to enjoy the views from. There is plenty of open space around the condo where the kids can play in the snow and go sledding! Downstairs has two bedrooms and a bathroom. The main level has the kitchen, dining room and living room and upstairs has the second bathroom and loft. Bedroom #1 has a king bed, Bedroom #2 has a Queen and twin bed, there is a new sleep sofa with memory foam mattress in the living room and the loft has a twin over full bunk bed. All rooms have TV and Cable and there is WiFi as well. NO PETS AND NO SMOKING!! In 2008 we bought a studio+loft in the same complex. Soon after we had 2 kids and quickly started outgrowing it. In 2011 prices were right so we decided to start looking for something bigger that would work for our family for years to come. 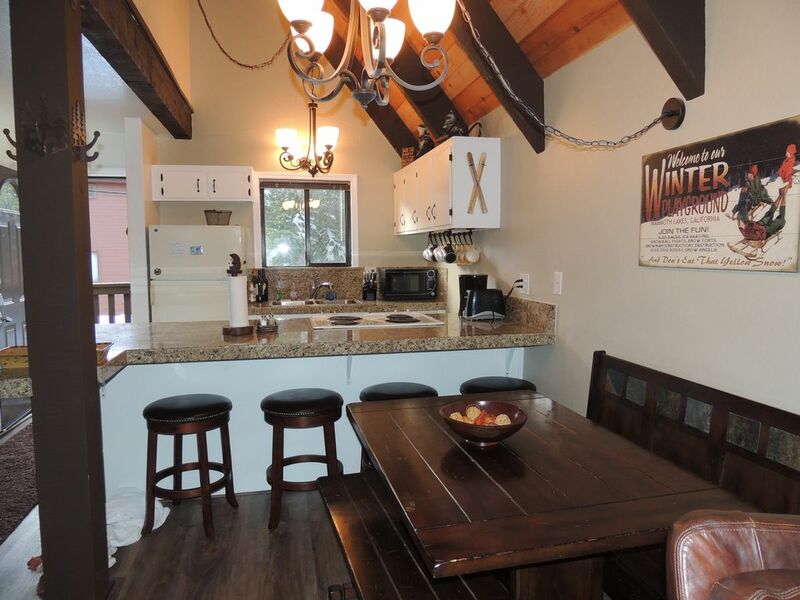 We loved the layout and location of Mammoth View Villas condos so we decided to buy this unit. We looked at sooooo many properties and we choose this one because of the views of the Sierras. I wanted a condo with a cabin feel and this one was it! You look out to wilderness and beauty and not the guy next door. And the other thing we loved about the condo is its location, location, location. Once we arrive in Mammoth we don't like to drive. We are a 3 minute walk to the Village and never have to fight the crowds getting a parking space. 5 minute walk to the Village! Fabulous views of the mountains! NEW wood pellet stove. Enjoy the fire without all the work! NEW range & dishwasher. Fully Stocked with dishes, pots and pans. There is no better location in Mammoth than Mammoth View Villas!! Really enjoyed our stay at this property! Centrally located, well stocked kitchen, and awesome hassle-free fireplace! Thought the condo worked very well for our needs as 3 guys on a fly fishing trip. Any suggestions might be to check the mold odor coming from the downstairs bedroom area. Our family really enjoyed staying here. Erin was so helpful and answered all the questions I had. I love that everything is close by and in walking distance to the village if not there is a shuttle that drives around the area. Definitely considering staying here again in the future. Perfect location, nice and quiet! Overall, we had a really nice stay here. The owner Erin was very easy to get a hold of and responded quickly to any questions or concerns I had prior to and during our stay. The condo was very well equipped with every convenience you would need like extra towels, toiletries, washer/dryer, kitchen appliances, etc. We did notice a funny smell when we checked in, almost like wet dog smell, and the carpets are pretty badly stained and worn down. This rental property is NOT pet friendly, so I'm not sure where the smell came from. The other downside was that there isn't a bathroom on the main living room floor. So if you need to go, you have to either go upstairs or downstairs. Not a big deal, but just something to note. I would definitely consider this condo for our future stays in the area. We had a great time staying here! Erin took care of us right away when we needed her! The only thing that bothered us was the carpet was a little dirty. But I know that its probably from the winter months. Maybe a little shampooing would make it better. Other then that it was cozy and we enjoyed our stay. Cozy condo, comfy beds. Plenty of space for 3 couples to stay. Close to everything we needed and walking distance to the village. Condos are a bit hidden so no traffic coming through, area is very quiet. Walking distance to the Village!